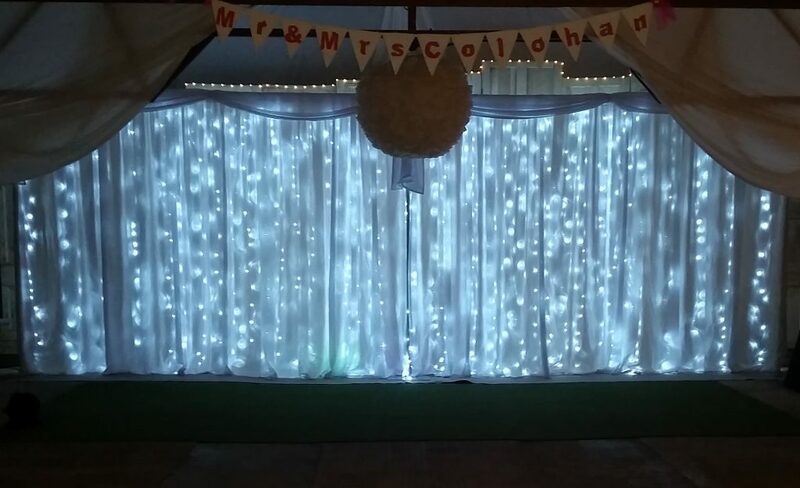 Get the WOW factor, Transform the room, Hide unsightly walls, whatever your motivation our wedding backdrops are made to impress! Whats more these are not exclusive for weddings, Available to hire for any event! Made in Britain from a premium quality fire retardant white polyester. These backdrops have a high gram per square metre weave giving the material a luxurious feel and exquisite look. With a weight of 15kgs per backdrop curtain, We supply these on the heaviest duty free standing pipe and drape frames available to the UK. Unlike cheaper systems which utilise PVC pipe frame and thin drapes. Our frames comprise of 50mm (2″) aluminium pipe and 8kg steel base plates for ultimate stability and safety. The high weave density in our backdrops make it extremely difficult to see through, Providing a uniform finish and rendering them ideal for hiding unsightly walls. Back-lit in White LED lighting and dressed with Satin white swagging. 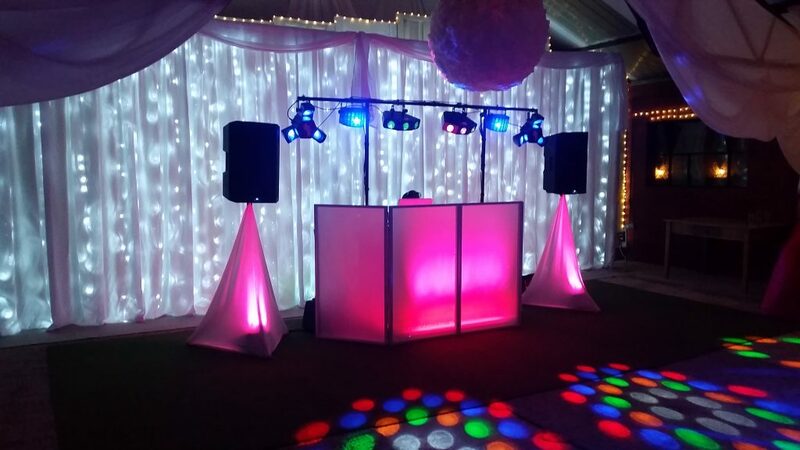 Combine the backdrop with our Colour-wash Lighting of the DJ booth and Speakers for real colour impact! Comprising of a single section, this backdrop is better suited for smaller spaces. Made from the same premium quality fire retardant polyester as its larger counterpart, this backdrop is also supplied on the UK’s heaviest duty pipe frame system. Dressed with satin white swagging. 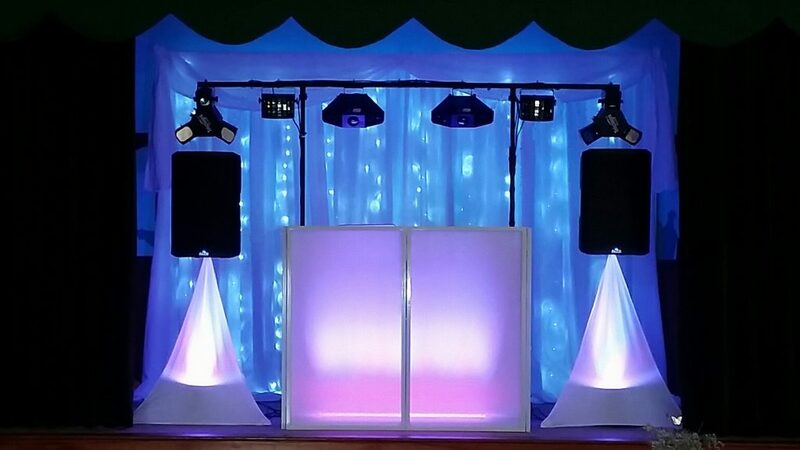 Combine the backdrop with our Colour-wash Lighting of the DJ booth and Speakers to match your colour theme! Utilising a 2 section heavy duty pipe and drape frame set in 90 degree’s and dressed in our premium quality fire retardant polyester, This backdrop is ideal for corners. Available with or without the satin white Swagging, this backdrop is also back-lit in ice white using LED lighting. In the photo below, Our client combined our colour-wash lighting with blue up lighting to create an impact! 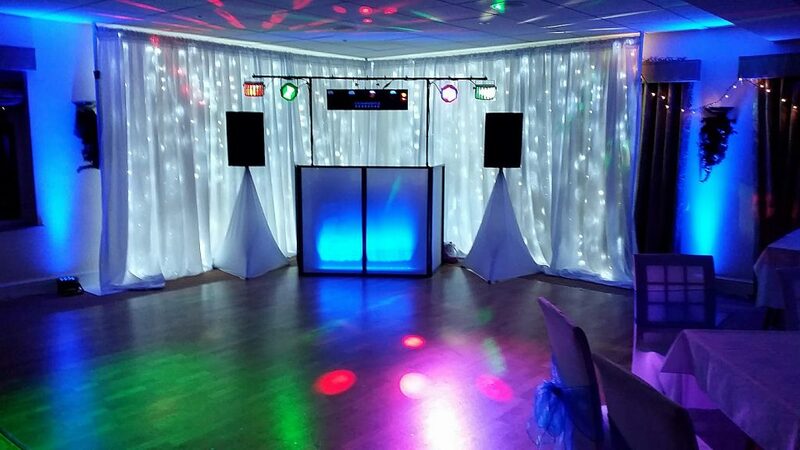 Available as part of our Professional DJ packages or Hire independently. We will supply either 3.5m (12ft) or 7m (24ft) sections (either configuration) depending on available space. Hire includes setup and collection! If booked as part of our Professional DJ packages, There will be no travel charge. Backdrops are subject to availability, We will advise at the time of enquiry. Our Star-lit Feature Wall uses the same heavy duty aluminium pipe frame as our backdrops. Note: This would be on maximum adjustment of each frame. For a truly unique look, Use all 3 backdrops to make a cube. 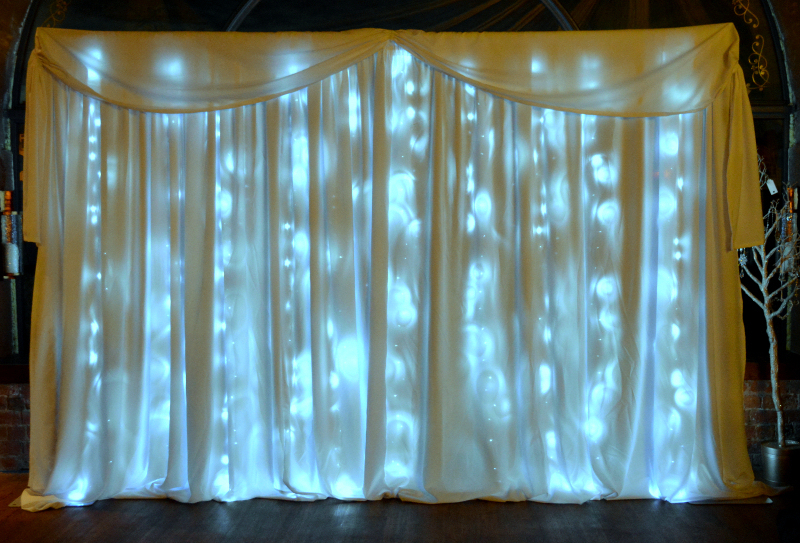 Picture your ceremony hosted inside a cube of Star-lit drapes with your guests watching from the open front. Regardless of the angle, Your photographer would capture picturesque photos.